The Masked Flowerpiercer is a distinctive little bird in the Tanager family inhabiting the higher altitudes of the tropical rainforest. Ranging from the mountains of northern Venezuela and along the slopes of the Andes from western Venezuela down through western Bolivia, this beautiful passarine (perching bird) is common within the mountain forests and nearby gardens. In Ecuador, the Masked Flowerpiercer can be found inhabiting the woodland shrubbery from 2,400 to 3,500 m (8,000 to 11,500 ft). It can be observed on both the eastern and western slopes and locally within the Inter-Andean valley at reserves such as Pasachoa Wildlife Refuge near Quito, Ecuador. The Masked Flowerpiercer has been encountered at higher altitudes in patches of Polylepsis (trees belonging to the rose family growing at high altitudes up to 4,500 m). In southwest Ecuador areas such as El Oro and western Loja, however, it can be seen below 2,000 m (6,500 ft). There are eight species of flowerpiercers existent in the country. Flowerpiercers are a tiny bird compared to most tanagers. They range is length from 11.5 to 14.5 cm (4.5 to 5.75 in). The Masked and the Glossy flowerpiercers are among the largest. Their most obvious characteristic is a distinctive upturned bill that is sharply curved at the tip. Other than the White-sided and Rusty species, the males and females are relatively similar with black, gray and blue hues predominant. The Masked Flowerpiercer is distinguished by it piercing red iris contrasting with a fairly large black mask and its intense ultramarine blue plumage. The female is similarly adorned although slightly duller in appearance. The bill has a noticeable hook at the tip, which can help to differentiate it from similar species. 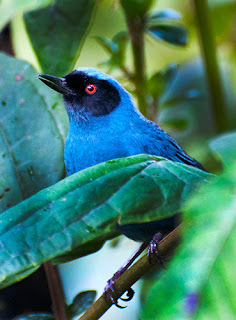 Other species that inhabit the same environments with the Masked Flowerpiercer are the Bluish and the Indigo Flowerpiercers. However, the Bluish lacks the large eye patch that is so pronounced in the masked variety and has an overall blue color and a less pronounced hook to the tip of its bill. The Indigo is much scarcer and it too lacks the distinguishable facial characteristics of the former. The Blue-and-Black Tanager is similarly colored but has a black iris, a normally shaped bill and black wing and tail feathers. 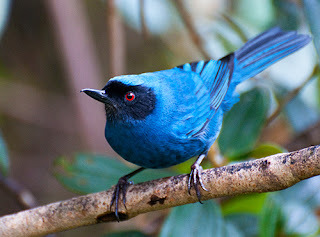 The Masked Flowerpiercer is often encountered in mixed flocks, frequently dominating the bird species in many upper-elevations rainforest locations. It is regularly observed with other flowerpiercers as well as various tanager species. Feeding primarily on nectar and small fruit, it is routinely detected in the company of hummingbirds, vying for the same source of nourishment. Its hooked bill allows it to attack the flower from its base, piercing the corolla and extracting the rich sugary treasure within. When in small flocks, flowerpiercers are normally heard before being seen, their high-pitched twitterings resembling chatter. A brief moment of quiet and patience will bring them into the open where they can be seen hopping nervously among the branches of low-lying bushes. The Masked Flowerpiercer is a lovely little passarine that inhabits the high-altitude tropical rainforest of the Ecuadorian Andes. Its cheerful song and lively antics as it feeds upon the mountain flora will delight and entertain the wandering traveler. This beautiful bird can be observed at Bellavista Forest Reserve, Cantón Rumiñahui, Copa Linga Lodge, El Cajas National Park, Guango Lodge & Reserve, Huashapamba Forest Reserve, Mindo Valley, Podocarpus-Bombuscaro & Vicinity, Podocarpus-Cajanuma, Papallacta Pass, San Isidro Reserve, Tapichalaca Reserve, Tandayapa Valley, Utuana Reserve, and Yanacocha Reserve.